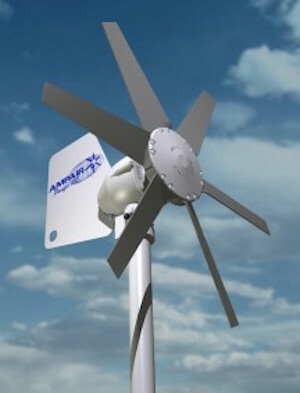 The Ampair 100 Wind Turbine is a microwind turbine for charging battery systems in harsh conditions. Although it only generates up to 100 watts of electrical power in practice it can outperform 400 watt machines because of its low windspeed performance. Generates up to 100 watts for 12 volt or 24 volt battery systems. Heavy duty, all-weather generator, sealed to keep corrosion out. Permanent installation as a fit & forget unit. Found in many other applications such as weekend chalets, radio repeaters, navigation equipment or anywhere that requires 12v/24v battery charging. Save the cost of fuel and the need to run noisy engines. Reduce engine running under light loads · Supplement solar charger output with energy that is potentially available day and night; winter and summer. Improve battery condition and extend battery lifetime. Increase battery charging out of summer season when electrical demand increases but sunlight reduces. Since 1973 Ampair wind turbines have been manufactured in the UK for use in extreme conditions worldwide. Several years later the Aquair hybrid wind and water turbines were introduced, followed soon after by the Aquair UW micro hydro generator (now just called the Underwater). The business was initially started in 1972 in Guildford and soon moved down to Poole in Dorset. In 2000 the Ampair business was taken over by Doughty Engineering Ltd and production moved from Poole to Ringwood. In late 2005 ownership transferred to Boost Energy Systems Ltd at which point production moved to Warfield in Berkshire. Boost have been active in manufacturing distributed power systems in the UK since 1957, concentrating on the 1kW to 50kW market. This was a friendly acquisition and we have been able to relocate most of the staff to the main manufacturing premises in Berkshire, or make arrangements for them to continue on an outsourced basis. Most of the supply base has been unaffected and indeed Doughty continue to act as one of the Ampair foundries. AmpairR and AquairR remain the main brand names of Ampair, and are joined by PowerFurlTM. At Ampair we believe that sustainable societies can only be built with integrated mixed economies based upon a variety of energy sources with a long term future. For this reason we continue to invest in our UK manufacturing operations and are actively seeking to develop our renewable and distributed energy business. In 2010 Ampair Energy Limited purchased the business and assets of Boost Energy Systems Limited. At the same time the venture capital group Sigma Capital Group plc has committed £1.5m to the business. All of the existing employees remain with the business and are supporting the move to larger premises in Dorset.